Taylor’s Grand Concert 12-strings reaffirm Taylor’s heritage of easy-playing double course instruments thanks to a lap-friendly body size, a 12-fret neck, and a 24-7/8-inch scale length. The slinky hand feel makes fretting and bending strings easier, the neck and body are comfortably balanced, and the compact body produces a clear 12-string voice. 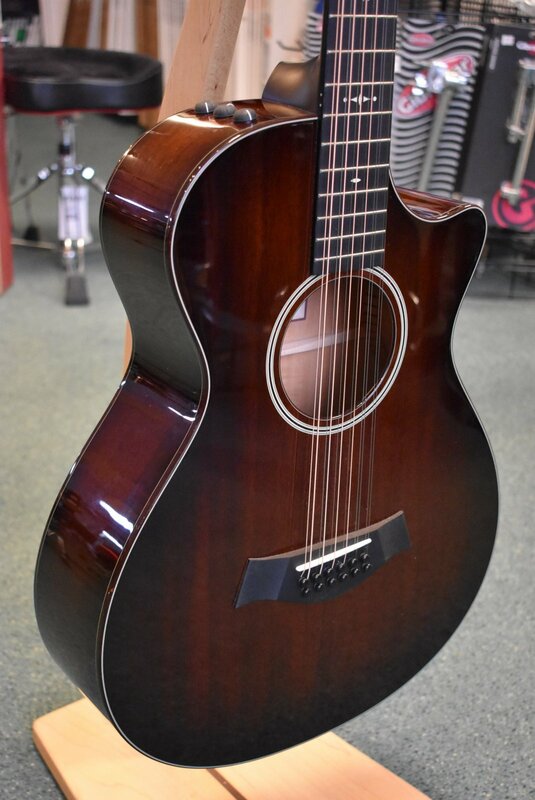 The hardwood mahogany top adds just enough compression to the attack to smooth out the response, bringing an appealing consistency across the tonal spectrum, while still capturing the beautiful octave shimmer. It makes a great 12-string choice for tracking in a studio, and behaves well with other instruments in a live setting. Refined aesthetic touches include a shaded edgeburst body and neck, faux tortoise shell binding, a rosette of faux tortoise shell and grained ivoroid, and a grained ivoroid Century fretboard inlay.